The Wibit Sports Park is an Amazing Inflatable Adventure Island! This summer your quiet, serene lake house could be transformed into an exciting waterpark! 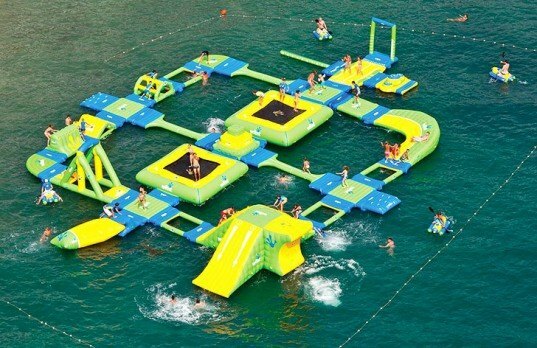 The Wibit Sports Park 60 is an inflatable island, complete with everything you need for water-based fun—and even includes some features, such as trampolines and swings, that one might not immediately associate with an afternoon spent cooling off in the pool. 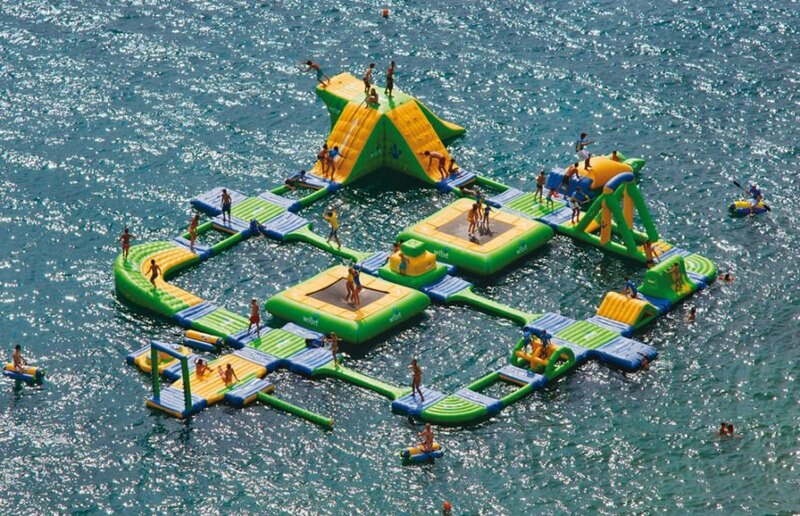 This giant floating paradise can entertain up to sixty of your closest friends. Fully assembled and inflated, the Sports Park 60 takes up a hardly modest 131 feet by 105 feet in the open water, and rises almost 10 feet high. A raft base marks the entrance to your water park fun, which attaches to a bridge that the kids can have fun climbing over or jumping off of. Adventurers can get in some strength training by climbing up the inflatable cliff, then plunge back into the lake on the slide. Or take the swing, and jump off mid-flight! The Sports Park can also function as an obstacle course, challenging your friends to races up the Action Tower, chicken fights off the balance beam or launches over the high jump. Kids can enjoy bouncing on the inflatable trampoline, with no risk of injury from falling on the ground, unless of course they want to purposely launch off using the water Katapult. The ramp makes it easy to get back on the island should they bounce off into the water. Of course the Sports Park 60 can be used for relaxation, with comfortable lounging possible virtually anywhere on the giant float. If you’ve ever wanted your own private island, Sports Park 60 may be the way to get it this summer! We have a group of lake people interested in purchasing, we would each buy a segment. Do you have a catalog you could send please ? Fully assembled and inflated, the Sports Park 60 takes up a hardly modest 131 feet by 105 feet in the open water, and rises almost 10 feet high. A raft base marks the entrance to your water park fun, which attaches to a bridge and the kids will have fun climbing over or jumping off of. Adventurers can get in some strength training by climbing up the inflatable cliff, then plunge back into the lake on the slide. Or take the swing, and jump off mid-flight! The Sports Park can also function as an obstacle course, challenging your friends to races up the Action Tower, chicken fights off the balance beam or launches over the high jump. Kids will have fun bouncing on the inflatable trampoline, with no risk of injury from falling on the ground, unless of course they want to purposely launch off using the water Katapult. The ramp makes it easy to get back on the island should they bounce off into the water. Of course the Sports Park 60 can be used for relaxation, with comfortable lounging possible virtually anywhere on the giant float. If you’ve ever wanted your own private island, Sports Park 60 may be the way to get it this summer!